As to your surprise that I did not sooner make the proposal to divide time with you, I can only say I made it as soon as I resolved to make it. I did not know but that such proposal would come from you; I waited respectfully to see. It may have been well known to you that you went to Springfield for the purpose of agreeing on the plan of campaign; but it was not so known to me. When your appointments were announced in the papers, extending only to the 21st. of August, I, for the first time, considered it certain that you would make no proposal to me; and then resolved, that if my friends occured, I would make one to you. As soon thereafter as I could see and consult with friends satisfactorily, I did make the proposal. It did not occur to me that the proposed arrangement could derange your plan, after the latest of your appointments already made. After, there was, before the election, largely over two months of clear time. For you to say that we have already spoken at Chicago and Springfield, and that on both occasions I had the concluding speech, is hardly a fair statement. The truth rather is this. At Chicago, July 9th, you made a carefully prepared conclusion on my speech of June 16th. ; twentyfour hours after I made a hasty conclusion on yours of the 9th; you had six days to prepare, and conclude on me again at Bloomington on the 16th. ; twentyfour hours after I concluded on you again at Springfield. In the mean time you had made another conclusion on me at Springfield, which I did not hear, and of the contents of which I knew nothing when I spoke; so that your speech made in day-light, and mine at night of the 17th. at Springfield were both made in perfect independence of each other. The dates of making all these speeches, will show, I think, that in the matter of time for preparation, the advantage has all been on your side; and that none of the external circumstances have stood to my advantage. Your letter, dated yesterday, accepting my proposition for a discussion at one prominent point in each Congressional district. Stated in my previous letter was received this morning. Mr. Lincoln also complained bitterly about the way that Douglas twisted, manipulated and misrepresented the truth about statements made by himself and others. 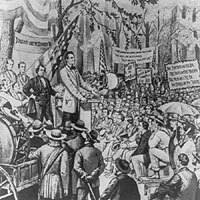 The tactic was clear from the outset at the Ottawa debate when Senator misrepresented Mr. Lincoln’s representation at a convention that didn’t meet and Mr. Lincoln didn’t attend and which didn’t issue the resolutions which Douglas said that had been issued. 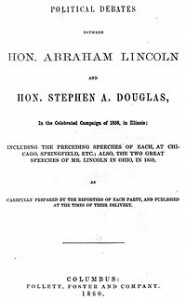 At virtually every debate, Mr. Lincoln spent much of his allotted time refuting Douglas’s statements and demonstrating the shady foundations of his veracity. Roy P. Basler, editor, The Collected Works of Abraham Lincoln, Volume II, p. 522 (Letter to Stephen A. Douglas, July 24, 1858). Robert W. Johannsen, editor, The Letters of Stephen A. Douglas, p. 423 (Letter to Abraham Lincoln from Stephen Douglas, July 24, 1858). Robert W. Johannsen, editor, The Letters of Stephen A. Douglas, p. 424 (Letter to Abraham Lincoln from Stephen Douglas, July 24, 1858). Roy P. Basler, editor, The Collected Works of Abraham Lincoln, Volume II, p. 528-530 (Letter to Stephen A. Douglas, July 29, 1858). Don E. Fehrenbacher, Prelude to Greatness: Lincoln in the 1850’s, p. 100. Damon Wells, Stephen Douglas: The Last Years, 1857-1861, p. 83-84. Robert W. Johannsen, editor, The Letters of Stephen A. Douglas, p. 424-425 (Letter to Abraham Lincoln from Stephen Douglas, July 30, 1858). Roy P. Basler, editor, The Collected Works of Abraham Lincoln, Volume II, p. 531 (Letter to Stephen Douglas, July 31, 1858). 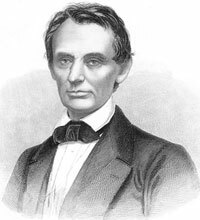 Henry Rankin, Abraham Lincoln: The First American, p. 244-246. Josiah G. Holland, Holland’s Life of Abraham Lincoln, p. 180-181. Francis Fisher Browne, The Every-Day Life of Abraham Lincoln, p. 287. Damon Wells, Stephen Douglas: The Last Years, 1857-1861, p. 91. Don E. Fehrenbacher, Prelude to Greatness: Lincoln in the 1850’s, p. 107. Olivier Fraysse, Lincoln Land, and Labor: 1809-60, p. 169. 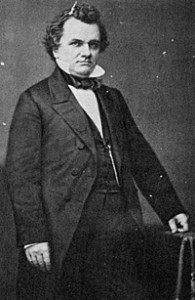 Robert W. Johannsen, Stephen A. Douglas, p. 665. Harry V. Jaffa, Crisis in the House Divided, p. 47-48. Kenneth J. Winkle, The Young Eagle: The Rise of Abraham Lincoln, p. 301. Gerald M. Capers, Stephen A. Douglas Defender of the Union, p. 124-125. Damon Wells, Stephen Douglas: The Last Years, 1857-1861, p. 93-94. Francis Grierson, The Valley of the Shadows, p. 196. Francis Grierson, The Valley of the Shadows, p. 198-199. John G. Nicolay and John Hay, Abraham Lincoln: A History, Volume II, p. 147. Gerald M. Capers, Stephen A. Douglas Defender of the Union, p. 15. William E. Barton, The Life of Abraham Lincoln, Volume I, p. 396-397. Francis Grierson, The Valley of the Shadows, p. 199. John T. Morse, Jr., Abraham Lincoln, Volume I, p. 147. Ida M. Tarbell, Lincoln and His Ancestors, p. 358. Herbert Mitgang, The Fiery Trial: A Life of Abraham Lincoln, p. 44. James G. Randall, Lincoln the President, Springfield to Gettysburg, Volume I, p. 125. Stephen Oates, Abraham Lincoln: The Man Behind the Myths, p. 71-72. Josiah G. Holland, Holland’s Life of Abraham Lincoln, p. 191. Robert W. Johannsen, Stephen A. Douglas, p. 395. Roy P. Basler, The Lincoln Legend, p. 223. William E. Barton, The Life of Abraham Lincoln, Volume I, p. 389. William and Bruce Catton, Two Roads to Sumter, p. 157. Ida M. Tarbell, The Life of Abraham Lincoln, Volume I, p. 314. Katherine Helm, Mary: Wife of Lincoln, p. 140. Blaine Brooks Gernon, Lincoln in the Political Circus, p. 153.